When the Romans invaded in AD 47, the Brigante were in control of much of what is now Northern England. Territorially the largest tribe in Britain, they were matriarchal, with their capital at a town now called Aldborough in North Yorkshire. Like many others, the Brigante, led by Queen Cartimandua, accepted the Roman Empire, probably understanding they couldn’t compete against such a power. Additionally, having the Roman Empire as defenders of the tribe must have been appealing, as indeed would the luxuries and culture the Romans brought with them. The next decade though, saw Cartimandua’s husband, Venutius, divorce his wife, gather an army and invade her kingdom. By 69 he had taken control and there followed decades of warfare in Brigantian territory. Tacitus refers to the Brigantes, back again “under a woman’s leadership”, almost defeating the Romans. It’s thought one of the main purposes of Hadrian’s Wall was to stop the Brigantes from joining forces with tribes further north in the lowlands of Scotland. After 400, a great change took place in Britain that affected its culture, language and religion. Although much of Roman Britain was flourishing, by the 4th century its Empire was weakened by civil wars and violent succession of emperors and was under constant attack from “barbarian” Germanic tribes. And Britain was not free of the chaos that ensued. According to the historian Ammianus, by 364 raiding in Britain was becoming endemic, as Saxons in the east, the Irish in the west and the Picts from the north battered the Island. It must be noted however, that Ammianus, like many ancient historians, had a strong political and religious agenda to adhere to. More recent historians and archaeologists, such as Francis Pryor, argue there is no evidence for Anglo-Saxon invasions. Instead they insist that trade flourished. Whatever the truth, it’s certainly true that the northern frontier of the empire was not uppermost in the minds of emperors. In 401 Hadrian’s Wall was stripped of Roman troops for the final time. The Germanic raids on the continent had increased in intensity and were penetrating to the very heart of Rome’s western empire. Roman soldiers were desperately needed elsewhere. In 410 the Goths, who only six years earlier had been the strong right arm of the Empire, captured and looted Rome itself, although the centre of its imperial power had already shifted east to Constantinople. In 407 Constantine rallied the remaining troops in Britain, led them across the Channel into Gaul, rallied support there, and set himself up as Western Roman Emperor. Britain, according to Bede and other Roman Catholic historians, was now without any troops for protection and having suffered particularly severe Saxon raids in 408 and 409, expelled Constantine’s magistrates, rejected Roman law, reverted to their native customs and armed themselves to ensure their own safety. Responsibility for law and order naturally fell to family and kinships. The greatest households occupied locations that were easier to defend, such as Bamburgh, Edinburgh and Yeavering. The following centuries were to be termed ‘The Dark Ages’, referring to an assumption that Europe suffered from a terrible decline after the collapse of the Roman Empire, with warfare, disease and mass migration the only constants. Recent archaeological discoveries however, have led historians to reconsider; it seems European culture reached new heights in artistry, architecture, craft and commerce, as well as learning. Northumbria, with its twin monastery of Wearmouth and Jarrow, emerged as one of the major centres of learning and was home to Bede, recognised as England’s first historian and one of the most influential figures in early Christianity. It seems certainly true that the Roman exit led to warrior bands raiding each other in bids for territory and power. British leaders in the more Romanised south invited pagan Saxon warriors into the country because they weren’t able to rely on Roman soldiers for defence as they had done beforehand. According to the history books, by 440, Angles, from what is now the border of Germany and Denmark, and Saxons, from what is now Northern Germany, had realised how vulnerable Britain was and had taken control of much of lowland Britain. This invasion theory has lasted for centuries. Francis Pryor argues it was invented by Roman Catholic historians such as Bede, who disregarded what was already a flourishing Christianity, in favour of their own political and religious agenda – that Angles came down on the unworthy Britons for returning to their pagan ways when the Romans left. Instead, says Pryor and a good number of other modern historians, it is more likely that Britons adopted the culture and fashion of the Angles as they recognised the world was a rapidly changing place. Angles may well have come across the sea, but not as invaders; rather as traders. Traditional history states Angles colonised north of the Humber, in the area known as Deira, heartland of what was once Brigante territory, by 450. British warriors battled bravely against the new invaders. Legend says King Arthur and his Knights of the Round Table fought heroically against the Angles in the northern hills and that Bamburgh was the castle given to Sir Lancelot, the bravest of his 150 knights and the place to which he carried Queen Guinevere herself. But, however true the legend of King Arthur, some tribes were forced to retreat over mountains in the north and west as areas were colonised and its people forced to accept new rulers. And it was from this new colonisation that the great kingdom of Northumbria, initially two separate kingdoms in Deira and Bernicia, was created. King Ida the Flamebearer seized Bamburgh in 547, taking control of the kingdom of Bernicia which ran from the Firth of Forth to Teesside. Over the next twelve years Angles arrived by sea and land, settling and seemingly co-existing with Britons that didn’t put up a fight. Alnwick, Whittingham, Warkworth and Berwick were main settlements, and a heathen temple to Woden, the God of War, was built at Alnmouth. Over the hills and mountains to the west, the British kingdom of Rheged, led by King Urien and supported by other northern tribes, almost recaptured Bamburgh and besieged the Anglian nobility who had retreated to Lindisfarne, but eventually Urien was killed and the Angles victorious. Aidan, king of the Irish who’d established a state in what is now Scotland, assembled a huge army in 603 and attacked Aethelfrith, but came away with just a few survivors. “From that day until the present,” Bede wrote in 731, “no king of the Scots in Britain has dared make war on the English.” But Aethelfrith didn’t stop there. A decade later, he marched south to face the Welsh at Chester. It’s said he was looking for Edwin, the exiled heir of Deira who he’d banished as a boy, and thought, wrongly, was given sanctuary by the Welsh. The sight of 1,200 monks by the side of the battlefield praying for a Welsh victory infuriated Aethelfrith. At this time the vast majority of British tribes had already converted to Christianity, while the Germanic tribes, such as the Angles and Saxons, commonly termed the English, were all pagan. Bede likened Aethelfrith to a ravening wolf, stating “in the morning he shall devour the prey, and at night he shall divide the spoil.” Aethelfrith, who was desperate for power, simply revelled in his nickname; The Destroyer. He had his troops surge into the unarmed monks and slaughter every one of them as they prayed. It’s said the Welsh were so stunned at the barbarity of this bloody massacre that they offered little resistance. In 616 the news that the Northumbrian king desperately wanted, reached Bamburgh; Edwin, rightful heir to the throne of Deira, now the southern half of the kingdom of Northumbria, had been found. He was three hundred miles away, at the court of King Redwald in East Anglia. Aethelfrith sent word by messenger; he would pay handsomely for the death of Prince Edwin. When this was refused he sent word once more; hand over the prince or prepare for war. Wary of Aethelfrith and unnerved by the gruesome stories he’d heard, King Redwald agreed to the demands, but his queen was angered and insisted he search his conscience instead. And so Redwald decided, not only to refuse Aethelfrith’s demands, but also to restore Prince Edwin, now aged 32, to the kingdom he had been denied as a young child. The East Anglians marched north with a huge army and when they met, on Mercian territory, south of the Humber, it was the southern army that outnumbered the northern. Aethelfrith was killed and his soldiers fled northwards in the direction of York, telling all that Prince Edwin was coming, not only to claim Deira as his own but also the whole kingdom of Northumbria. Aethelfrith’s three sons, Eanfrid, Oswald and Oswy, the first two young teenagers and the latter just four years old, took flight from Bamburgh and sought refuge on an island called Iona, something which would have great significance for the future of Northumbria. In York, jubilation greeted the long lost return of Edwin. His reign brought inner peace and stability, while externally they conquered new kingdoms and became the largest and most powerful kingdom in Britain, stretching from Hampshire to the Firth of Forth, where he had a fortress built on the great rock at Edinburgh. Indeed, it’s likely the Scottish capital is named after him. However, there was one thing Edwin still desired; the love of a woman. He found her in Kent, a princess named Ethelburga, who was happy to become queen of Northumbria but insisted upon one thing; that she be allowed to practice her Christian religion. Edwin agreed and so Ethelburga moved up north, bringing her personal chaplain, the Italian missionary Paulinus, recently consecrated as Bishop of York. Both implored Edwin to convert to Christianity but he resolutely refused, even when personal letters were sent from Rome. Eventually though, the pagan king would convert, and it was yet more treachery followed by another battle that convinced him. On the same night his queen went into labour, a messenger arrived from the southern kingdom of Wessex. Halfway through his message the stranger lunged at King Edwin with a sword, who was only saved from certain death by one of his counsellors who threw his own body in the way. 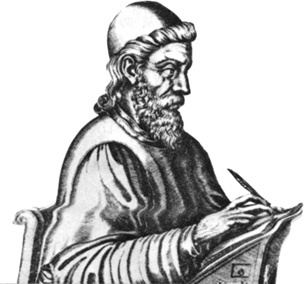 Bede wrote that the lunge was so violent the knife went right through the counsellor’s body and injured the king himself. 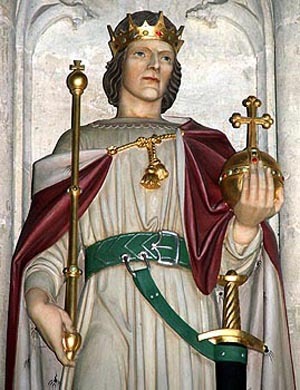 Later that night, when Edwin’s daughter was born, the king sent for Paulinus. If this man’s God could ensure victory against Wessex then he would convert to Christianity. Later that year, 626, Edwin’s forces marched south and defeated the West Saxons in Wessex, leading Edwin to term himself “Bretwalda,” overking of all England. In 627, on the site of York Minster, he was baptised by Bishop Paulinus, becoming the first Christian king of Northumbria. Late that year, while the king and queen stayed at the township of Yeavering Bell, previously a pagan temple, Paulinus baptised more than three thousand Northumbrians. Unfortunately for Edwin, his rule was only to last two years. Like Aethelfrith, he lost his life in battle south of York. Such was Northumbria’s power that the Christian kingdom of North Wales, led by King Cadwallon, and the pagan kingdom of Mercia, led by King Penda, joined forces to defeat Edwin. His son and heir to the throne was also killed and afterwards his wife and Bishop Paulinus moved back to Kent. 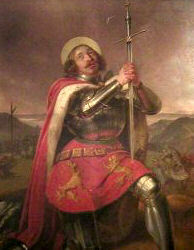 The Welsh army took control of York, and they took Edwin’s head with them to show his people. While in the northern part of Northumbria, Bernicia, Aethelfrith’s elder son Eanfrith came back to claim the throne and revert it to pagan rule. Again, change wasn’t far away, as it never was in the age of Northumbria. Eanfrith went to York to negotiate peace with Cadwallon and was murdered in cold blood. The Welsh king had a plan of his own making; complete annihilation of Northumbria. Intent on revenge for the decades of Northumbrian destruction of British kingdoms, Cadwallon marched his troops north on a trail of destruction. But out of the cheviots came Aethelfrith’s younger son, Oswald. He gathered together a small army and lured the Welsh to a place which was later called Heavenfield, seven hundred feet up in the hills above Hexham, just north of the Roman wall. Oswald, who had grown up in Iona, ordered a large wooden cross to be made and erected. And then, outnumbered as they were, he persuaded his soldiers to pray to the Christian god and promise to convert should they win. In the battle that followed the Welsh Britons were routed despite their superior numbers, and their king was killed. Oswald marched back to Bamburgh and sent a messenger to Iona for them to send a missionary to his newly won kingdom. That same year, 633, Aidan, later to become St Aidan, came south and chose Lindisfarne as the site to build his monastery. In seven days, Aidan is said to have baptised more than 15,000 people, but Oswald, later to become a saint himself, and highly praised by Bede, was also instrumental in the spread of Christianity. He married Princess Cyneburga of Wessex on the condition her father convert. East Anglia, the Picts and the Scots all acknowledged Oswald as their Bretwalda or overking. But less than nine years after Heavenfield, Oswald lay dead, and it was the old enemy, Mercia, led by the great pagan King Penda, that defeated him at Oswestry (Oswald’s Tree). Penda marched onto Bamburgh, destroying all before him, until they reached the Bernician fort, 150 feet up on that basalt crag. Aidan watched from Lindisfarne, two miles across the water, as the Mercian troops piled a massive bonfire around the fort and set fire to it. And as he prayed a miracle seemed to happen, for the wind changed direction and the flames were driven backwards to the Mercian army. Oswy was the next king of Bernicia, as Northumbria had now reverted once more to being two kingdoms. He had his Deiran rival Oswin murdered and combined the two once more, then destroyed the Mercian army and killed King Penda. Again, a Northumbrian king could claim to be Bretwalda. This defeat of the pagan King Penda seemed to herald the start of a great Christian era in Northumbria. Monasteries were founded at Ripon, Hartlepool and Whitby. The Synod of Whitby chose in favour of the Roman version of Christianity, meaning Lindisfarne, founded by Aidan from Iona, was forced to change from its Celtic Christian tradition. St Cuthbert was chosen to oversee this change and made his way from Melrose to act as prior. King Oswy died in 669 and was succeeded by his son Ecgfrith, who had one of the most important Roman Christian monasteries in the north built at Wearmouth, which held a great library with books imported from France and Rome. But Ecgfrith was raised on stories of great Northumbrian battles and tried to make his own name in history by expanding his kingdom overseas, landing with a troop of men on the shores of Northern Ireland in 684. St Cuthbert, exiled on Inner Farne, heard word of this and warned against such aggressive action, though the military operation came to nothing anyway. King Aldfrith, who succeeded Ecgfrith, had the monastery of Jarrow built on the banks of the Tyne. Among the new students was a nine-year old boy called Bede who was transferred from Wearmouth and thankfully survived a devastating plague that hit the area. St Cuthbert passed away peacefully on Inner Farne in 686. Six years later another of Northumbria’s greatest sons, Bede, was ordained as a deacon at Jarrow monastery at the age of nineteen. By 703 he had progressed to the rank of priest. in 692 Bede, a scholar at Jarrow monastery, was ordained as a deacon at the age of nineteen. By 703 he’d progressed to the rank of priest. There followed an era of great art and literature. The Codex Amiatinus, an illuminated bible, was created at Jarrow and the beautiful Lindisfarne Gospels was finished at Lindisfarne around 721. Bede wrote the Life of St Cuthbert and published a book that introduced dating from Christ’s birth, Anno Domini, which was eventually adopted by the entire Christian world. He did not invent the concept of AD but it is due to him this system was so widely adopted. Bede’s greatest work however, was his History of the English Church and People, completed at Jarrow in 731. He dedicated this work, the first history of England ever to be written, to King Ceolwulf of Northumbria. Again, it must be acknowledged that Bede was pursuing religious aims, and Pryor has argued the Northumbrian scholar (an Angle himself) invented the notion of the English people by stating they, with God’s fury, were brought down upon the unworthy British and then converted to Christianity and united the nation. Pryor does acknowledge that Bede was a brilliant writer however, and that his writings are the best records we have of life at that time. When Bede passed away in 735 Northumbria mourned the loss of its greatest scholar and historian. Soon they would mourn the loss of their great kingdom too, as throughout the rest of the eight century the kingdom collapsed into a state of anarchy brought about by weak leadership and rivalry between the royal houses of Deira and Bernicia. From 737 to 806, Northumbria had ten kings. Three were murdered, five were expelled and two retired to become monks. To make matters worse the Viking age started in 793 when Lindisfarne was attacked from across the seas. Northumbria was no longer a major player in English politics and culture, but was weak and vulnerable. The Viking raids continued throughout the ninth century. Change was once more afoot and again it came from foreign raiders who worshipped pagan gods of war. In the year 866 the great army of Vikings landed in East Anglia and started working their way northwards by land and sea. By 875 they’d taken control of Deira, had wrecked and plundered the monasteries at Wearmouth and Jarrow, and were sheltering by the Tyne for the winter, ready to make their final assault on Bernicia and grasp the whole of Northumbria in the spring. The monks at Lindisfarne, together with members of the local community, took hold of the coffin of their beloved St Cuthbert and placed it on a cart. Inside the coffin they placed the head of St Oswald and the bones of St Aidan, as well as the beautiful Lindisfarne Gospels and other relics. They knew not whether they would survive the journey ahead of them. But they knew they had no other choice, for to stay would be to offer themselves up as sacrifice.